This easy walk is ideal for aesthetes and those who enjoy the finer things in life. It leads through an elegant part of Prague located on hilly terrain east of the historical centre. Vinohrady got its name from the vineyards that Emperor Charles IV ordered to be planted here in the 14th century (one of which you will visit). 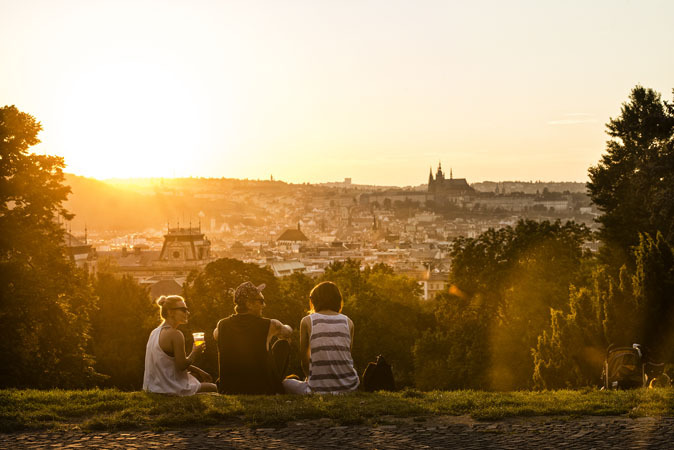 Elaborate façades, tree-lined streets, picturesque parks with city views, and an idyllic atmosphere ever so slightly reminiscent of Paris make this an area that the cream of Prague society have always favoured. Today, this cosmopolitan district is known not only for its high rents, but also for its top restaurants, wine bars, and cafés. 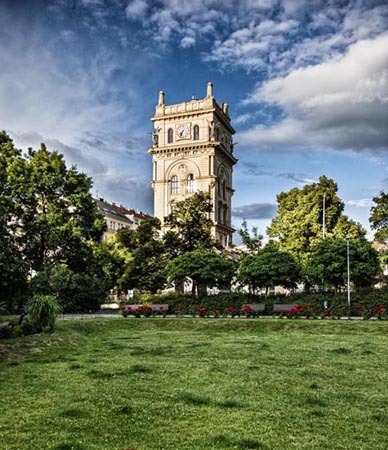 The walk will also explore a small part of Vršovice and Žižkov, two popular districts that share a thriving cultural life and are known for their eclectic mix of pubs, bars, and cultural clubs. This square lies at Vinohrady’s heart, with the neo-Gothic Church of St. Ludmila at its centre. Other important buildings on the square include the Vinohrady Theatre (Divadlo na Vinohradech) and the National House Vinohrady (Národní dům na Vinohradech), site of conferences, concerts, and balls. The Havlíčkovy Gardens were inspired by the Italian Renaissance. 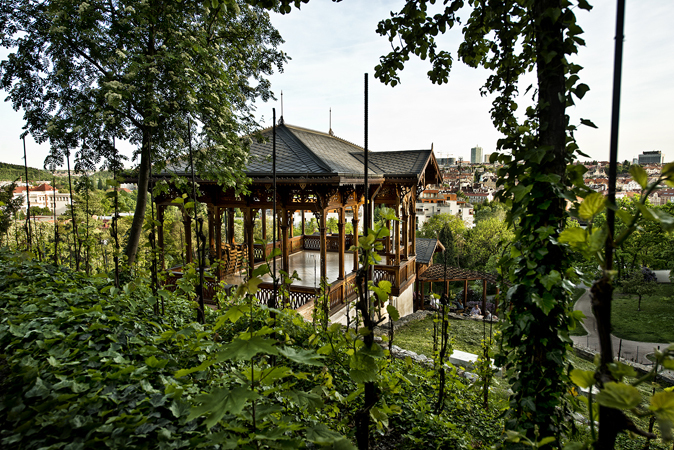 Grottoes, fountains, waterfalls, and a lake create a romantic atmosphere, beautifully complemented by the charming wooden gazebo in the middle of the vineyard. The entire complex is dominated by a stately villa with a terrace that offers views of the surrounding area. Rybalkova St. – Kozácká St. – Donská St. – Krymská St. Even readers of the New York Times know that inconspicuous and somewhat grubby Krymská Street is the centre of Prague’s alternative culture and the hippest address in the city. You’ll find a number of places that combine café and culture, plus a very authentic - but not too wild - form of nightlife. We recommend coming back here in the early evening. Curiosity: Rangherka is named after the Italian businessman Rangheri, who planted mulberry orchards here and founded Prague’s silk industry. Two buildings worthy of note are the Art Nouveau atelier belonging to sculptor Ladislav Šaloun (creator of the massive Jan Hus sculpture in Old Town Square) and a villa by Jan Kotěra, a noted Czech modernist architect. 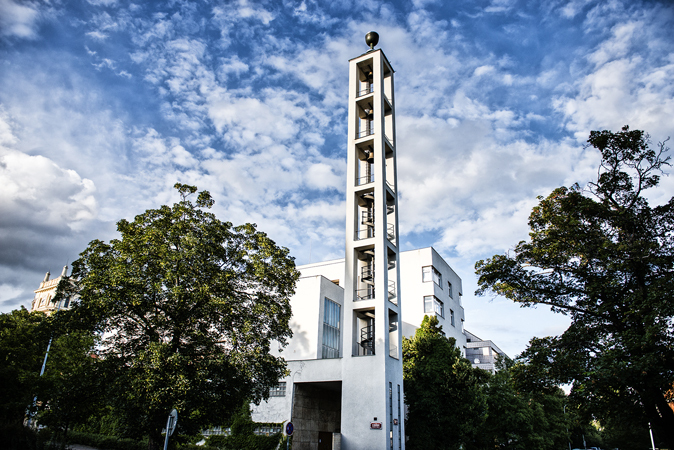 The striking building of the Hus Congregational House by Czech architect Pavel Janák entails three parts: a ceremonial hall, an apartment building, and a bell tower. 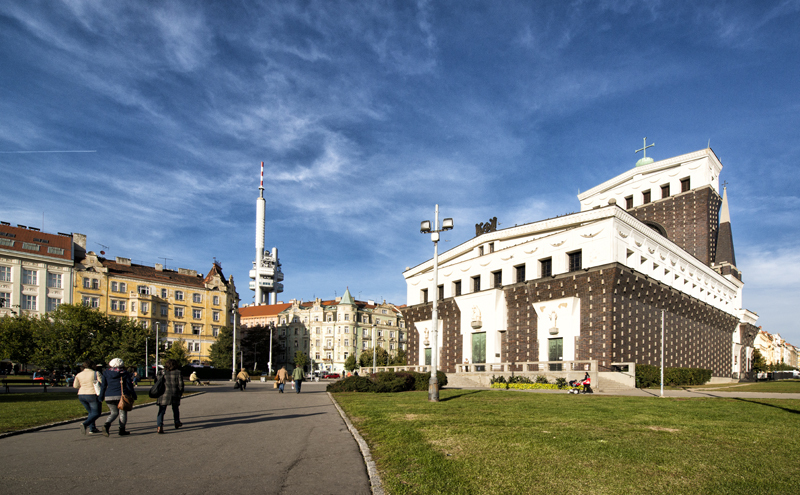 The structure is considered an icon of Czech functionalist architecture. This stately former water tower, once containing both pumps and water tanks, served its original purpose until 1962. 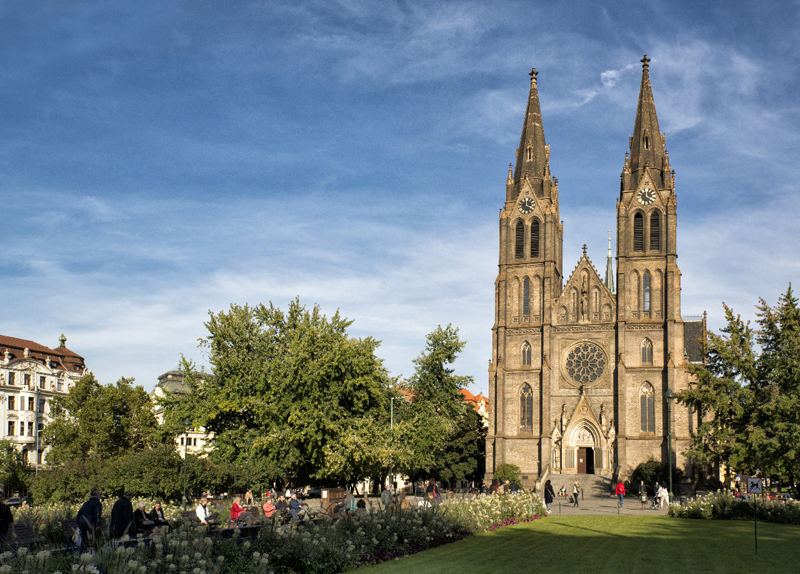 Arriving on the square, your eyes will be immediately drawn to the unusual monumental architecture of the Church of the Most Sacred Heart by Slovenian architect Jože Plečnik, who was also the creative force behind the modern modifications of Prague Castle. The church, whose form evokes Noah’s ark, is one of the most important 20th century religious buildings in Prague. The square is a frequent venue for a popular farmers’ market as well as other culinary and cultural events. Prague’s most controversial building and highest tower (216 m) still has its passionate supporters as well as those who would be happy to erase it from Prague’s skyline for good. Built between 1985 and 1992, it’s studded with bizarre giant babies by Czech artist David Černý. In addition to a viewing terrace (highly recommended! ), you’ll also find a restaurant and a unique one-room hotel. Palác Akropolis, Žižkov’s cultural hub with its uniquely conceived interiors including a restaurant, is popular among not only established artists, but also those just starting out – be it music, theatre, or visual art. 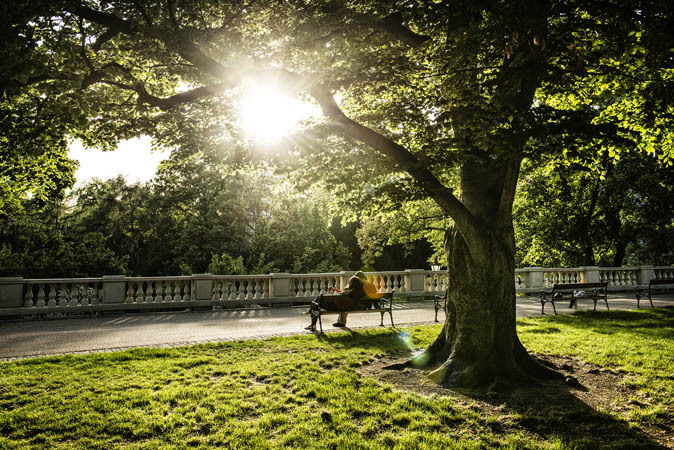 This park, over 100 years old, offers intimate nooks, open meadows, and unusual views of Prague’s skyline. During the summer, you’ll find a popular beer garden here that becomes a kind of second home for some locals. 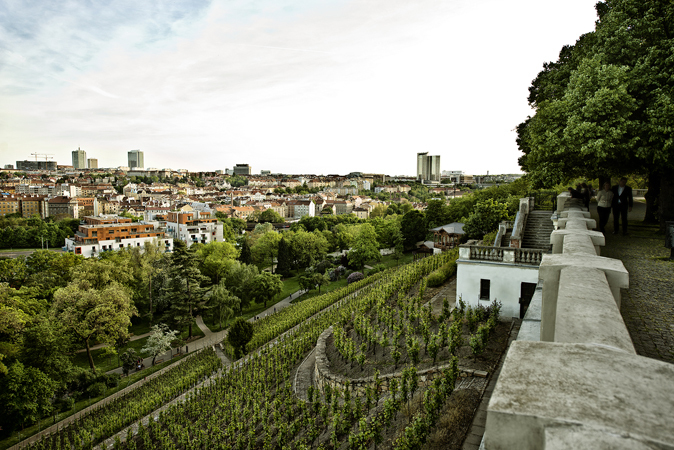 For a stunning vista of the Old Town and Prague Castle, head to the top of the meadow at the western edge of the park. In the summer it’s an ideal spot for a picnic.